Description: Serving others all the time just isn’t fun. It takes putting the needs of others before your own needs. Even the most selfless person doesn’t want to serve their enemies. However, I’d venture to say that even the most selfish person would serve Jesus if He walked into a room. So what’s the difference? According to Jesus, there shouldn’t be one. Split the group into two teams. On one end of the room, sit one person from each team with a clear bowl in front of them. On the other end, have the two teams line up behind two bowls of jell. The point of this game is to serve your teammate a bowl of jell. The catch is, you can only use the spoon with your mouth. One at a time, teammates must clench the scooper between their teeth use it to get a scoop of jell. They then must navigate to the other side of the room and dump it into their teammates bowl. If at any point they use their hands, they must dump it in the other team’s bowl. The first team to fill up the bowl of jell wins! Optional: You can also make the game more interesting my making the person they are serving eat the entire bowl of jello once it is full. As everyone sits down have leaders bring around drinks or snacks. Ask each student what they would like, and make a big deal about giving it to them. Since you guys did such a good job serving that jell, I thought we’d return the favor. Did everyone get something? Cool. So, I have a question: how does it make you feel to get waited on like that when you sit down? Pretty great, right? I bet you guys would come around here a lot more often if we served you treats in your seats every week! Really though, why does it feel so great? I mean, its just____ (a cookie, a soda, a piece of candy, etc.) You can buy one at any grocery store. It’s not that big of a deal, so why does it make you feel special? It’s because someone served you when you weren’t expecting it. No one had to serve you today. You would have been all right if you hadn’t received anything out of the ordinary. But someone served you, and that made your day better. 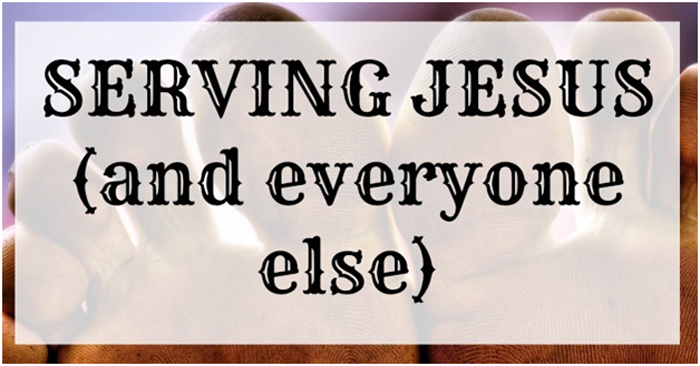 Let’s take a look and see what the Bible has to say about serving each other. Now, this is one of those verses that it’s easy to read and not really think about what it means. Let’s spend some time thinking about what exactly this verse means for our lives. This verse is saying that when we serve, we should serve wholeheartedly. Already, it’s a lot to take in. Think about it—the last time your mom asked you to do the dishes, I’m sure you did them. But did you do them wholeheartedly? Where you smile and do the best you can and put your heart into the job? I’m guessing the answer to that one is no. But that’s what God is calling us to do—to serve wholeheartedly. Think about what that means! Taking out the trash? Do it wholeheartedly. Babysitting your younger sibling? Babysit wholeheartedly. Helping your friend study for a test because they can’t seem to grasp the material? Help wholeheartedly. This could get exhausting! Okay, so we’re already exhausted from making sure that every act of service we do is done wholeheartedly, when we’re really thrown a fastball. Ooh. That’s a tough one. Let’s go back to the dishes analogy. Except this time, let’s pretend that Jesus came over to your house and asked you to do the dishes. Now, nothing against your mom, but I’m sure that the way you would do the dishes for Jesus is a little bit different than you would do them for your mom. You’d be washing and drying as fast as you could. You’d be making sure there wasn’t a single spot left when you were done. And you’d probably be doing it all with a great attitude. Am I right? Well, here we’re told that when we serve other people, we should serve them just like we were serving Jesus Himself. That’s a tough pill to swallow, isn’t it? Can you imagine? Really treating every person you served the way that you would treat Jesus if you were serving Him? Can you even imagine how much your life would change? Luckily for us, we have an amazing example when it comes to serving others. Okay, what’s going on here? Jesus, the Son of God, is getting down on the ground and washing His Disciples’ feet. I’m going to give you two reasons why this is a huge deal. One, these weren’t just feet. They were dirty, nasty, filthy feet. If I asked you guys to get on the ground and start washing each others’ feet, you’d probably be pretty grossed out, even though most people in here have probably had a shower at some point in the last twenty-four hours. The disciples, however, had not. And let’s just remember that cars did not exist yet, so everywhere they went, they walked. Now, if you thought your neighbor’s feet were gross before, imagine if they lived in a time where bathing was an occurrence that happened few and far between, and they spent the majority of their time walking on their feet. Like I said, nasty. The other reason that this is significant is that this was the night Jesus was betrayed and taken away to be killed. This was the final meal He had with the people who were closer to Him than anyone else in the World. He knew that this was going to be his final time with these people. He could have talked about anything, done anything, asked anything. Instead, He shows the most beautiful picture of servant-hood by getting grimy and dirty and washing their feet. Now, isn’t that just like Jesus to do something that blows our mind, and then go and blow our mind again? Not only did He lower Himself to the position of a servant, getting on the ground and getting dirty, but the next thing He said completely tore apart social norms in that age. He said no one is greater than anyone else, but rather that they are all the same. Slaves and masters, messengers and the ones who hire them…everyone is the same. If Jesus was giving that example today, what do you think it would sound like? The Popular and the unpopular are the same? The Rich and the poor are the same? The valedictorian and the dropout are the same? The boss and the janitor are the same?Try to wrap your head around that. Jesus is saying that the millionaire owner of a company is not any better than the janitor who cleans the building’s toilets. Why is that? It’s because He loves them both the same. He came so they could both have hope. He died so that both their sins could be forgiven. In His eyes, they’re the same. And neither one of them is above serving. So what does that mean for us? It means a few things. First of all, we have to get it through our heads that we’re all equal. We’re not better than anyone else, and not one of us is too good to serve others. Next, we have to come to terms with the fact that if we want to be like Jesus, it means we’re going to have to be a servant. We need to serve others because it’s what He wants us to do. Finally, we have to realize that it’s not enough to simply serve others. No, we need to serve them as if we were serving Jesus Himself. Is that going to be hard? Of course it is. No one wants to act thrilled about emptying the trash, or have a joyful attitude about sacrificing something they want so that someone else can have what they want. But imagine how amazing the world would be if we all did that. If all of our actions really were the same ones we would do for Jesus if we were serving Him. If, everytime someone asked us for help, we responded as if Jesus was on the other end of the conversation. Those were simple, easy acts of service. And they made people’s day! But did you notice one common reaction everyone had? They were happy, of course. But they were also surprised. Why? Because it’s not common. It’s not common to serve other people. It’s not common to sacrifice something and expect nothing in return. It’s not normal to go out of your way to help someone else. And that’s what makes it so powerful. If we did these things and treated these people like we’d treat Jesus, can you imagine the difference we would make in the world? 1. Would you say that serving others is something that you try to do on a daily basis, or is it something you don’t think too much about? 2. Has anyone made an impact on your life by serving you? 3. The Bible talks a lot about how we should strive to be more like Jesus. If that’s our goal, how does serving fit into that? 4. What’s the hardest part about serving others for you? 5. Do you think it’s actually possible to serve others in the same way that you would serve Jesus? 6. What’s one difference between the way you serve in your life now (doing chores, etc.) and the way you would serve if Jesus asked you to do something? 7. When Jesus washed the feet of His disciples, He reminded us that no one is greater than anyone else. Does that inspire you to serve others that you maybe would not have thought to serve before? 8. The act of serving that Jesus did as He washed the feet of His Disciples was one of the last things He did before He died. Does that make it seem more important to you? 9. How can you serve wholeheartedly in your current daily life? 10. Do you think it would make a difference if everyone served each other in the same way they would serve Jesus? What are some things that you think would change? When you think of things that Jesus wants you to do, what comes to mind? Probably things like loving each other, telling the truth, and obeying your parents. But serving is something that is obviously also very important to Him, since it’s one of the last things He talked about on this earth. Serving people is not going to be easy, but if your goal is to be more like Jesus, then it’s a huge step in that direction. Now, if you’re like most people in this room, then serving people like you would serve Jesus is going to be a huge change from your normal life. I thought we could do a little activity to help get us started. Under your seat is a sheet of paper and a pen. I want you to write down the first three acts of serving that come to your mind. Don’t make these personal; make them something that anyone could do. For example, you could serve someone by paying for their lunch, or by making your family breakfast without being asked. Now, fold that list up and pass it to your left. Keep passing until everyone has a list that’s not the one they wrote. Now you have some homework for the week! Take this list and do the things on it this week. While you’re doing them, remember how important it is to Jesus. Think of how proud He is of you for serving others. Remember to do it wholeheartedly, and, perhaps the hardest thing of all, remember to do them as if you were doing them for Jesus Himself. Jr High Youth Group Lesson on Jealousy.